ORCID is non-profit organisation visioning "a world where all who participate in research, scholarship, and innovation are uniquely identified and connected to their contributions across disciplines, borders, and time." Read more here. Institutional organizational affiliation -> Use ORCID already in publication submission. Publishers can confirm your University of Helsinki affiliation from ORCID.org. Other personal identifiers (e.g. Scopus author ID, Researcher ID) -> ORCID links your your publications from Scopus and Web of Science to your ORCID identifier. Your Tuhat portal URL -> Visible in your ORCID profile page, a link from ORCID to Tuhat ortal, and the other way round. Use ORCID in all your websites. Your research outputs, where publication state is either E-pub ahead of print or Published, visibility of the record is Public - No restriction, workflow status is Approved -> Publication DOI (Digital Object Identifier) connects your Tuhat publications with publications in Scopus and Web of Science, and also shows all these in your ORCID profile. Also link your publications to PlumX profile with ORCID. With KUDOS you can explain your publications in plain language, share them with social networks and then measure the effect. PlumX captures how people interact with your publications. University of Helsinki profile at plumX. Portal profile at https://researchportal.helsinki.fi is created automatically to current persons and organisations with related research output, research infrastructure, datasets, activities, prizes, press/media submitted to the research information system. Please see instructions below on how to edit personal profile for research portal. Name can be modified in Name variants, select Known as name. Postnominal title can be added after your name. Add other titles below your name. Affiliations are shown below name, but person can select which affiliations are visible in this overview page. Please note that affiliations are going to be heavily updated on Nov 12, 2018 to include all contracts and doctoral students. Wait until then to make these changes. Street map is automatically created from contact information. Bar chart shows time period and volume of publications and projects. Links section is located under portrait as icons. 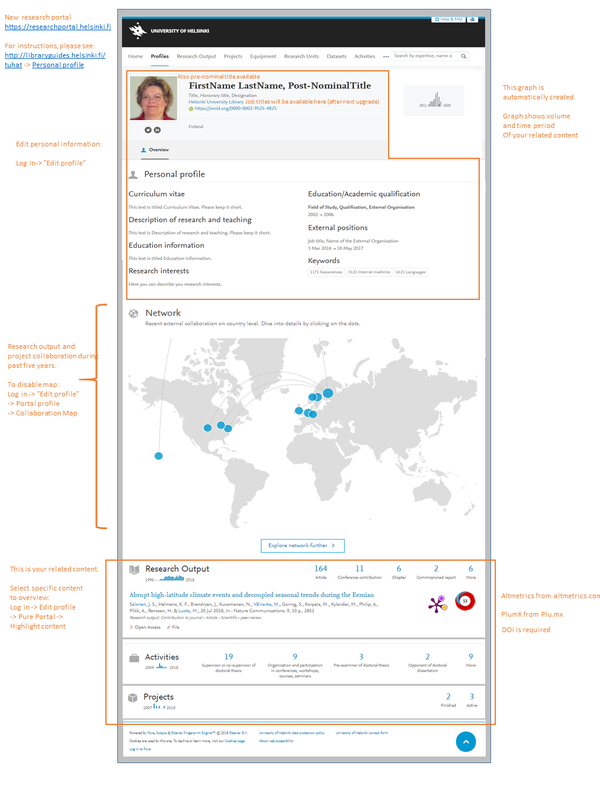 CV and link to Scopus profile are shown as text links. CV link can be created using Curriculum Vitae tool. Education and professional qualifications can be added. World map shows collaboration during past five years. This information is country of external organisation on publication or project. Quickest fix is to update collaboration to projects. Summaries of related content have been added. Content can be highlighted to your overview page (selected publications and projects). Publication list has PlumX and Altmetrics icons. Further information on affiliation -> text can be added to Description research and teaching. We are working on this to create links from old portal to the new one. Tuhat portal automatically publishes all information submitted to the database with visibility set to "Public - No Restriction". Persons and organisations automatically get public pages with all persons and their data linked to it. Open your profile page and Edit profile page side by side. As you scroll down the Edit profile page, you see headings that are also used on the profile page. Name you use in the portal is Name variants -> Known as name. To modify organisation pages, please contact tuhat-info for Organisation Editor privileges. You may add description, photo, addresses, fields of science. Instructions are here. Data from research group's public Tuhat pages can be shared with University of Helsinki websites using the RSS-feeds from the portal. For example: Research group's data from Tuhat portal is also available on research community website. To initiate this process, please contact digitalcomms-researchgroups@helsinki.fi first! Research community websites in Flamma. You can create many CV documents. Public CV is published in your portal overview page. You can set your CV to be automatically updated with new data (dynamic CV). CV can also be static, unchanged. Highlighted CV picks data to your portal overview page: With this CV type you can select which publications, projects and activities are shown in your personal overview page. By default the system shows last submitted data. EuroPASS CV enables your data to be transferred from Tuhat to EuroPASS where you can modify the CV. Annual reporting requirements and performance indicators are explained at the University of Helsinki Intranet. Reported data will be available in these services. Three-year grant is a University of Helsinki funding type, read more about the grant in Flamma. The awarded three-year grant is conditional, and requires that the Board of the University allocates the necessary funding when it decides on the University’s target programme and the budget for those years. In addition, the University monitors the progress and impact of research projects through reports. Create the three-year project to Tuhat as a Project. For project type, please select "University of Helsinki Three-Year Research Project"
Add all project participants to Project. Add relation from Project to other Tuhat content created with this funding. Create relation from Project to Awards (funding wbs). Awards are automatically imported from financial system and should be available for you. Create publications. Add relation from Project to Publications. Create impact. Describe the special significance of the three-year research grant for the project manager's progress of research and/or research career. Use impact category "Other impact". Set the visibility to "Confidential", which restricts this information to you and Tuhat administrators. Create relation from Project to Impact. Create activities. Create relation from Project to activities. 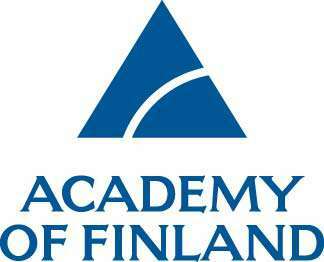 In the online reporting service of the Academy of Finland you can pick your publications from national VIRTA publication service. There is also a search you can use. If your publications are not available in VIRTA, you should submit them manually to Academy report or contact tuhat-info@helsinki.fi to find out why your publications are not available in VIRTA. Faculty and department level publication data is available at Rapo-reporting tool (in Finnish). It is possible to get access to more specific reporting in Tuhat where you can report on all Tuhat content. This option is available for academic leaders and university services. Please contact tuhat-info@helsinki.fi for more details. Publications that have been checked by librarians (workflow = approved) are transferred every morning from Tuhat to national VIRTA service which then publishes them in Juuli, national publication portal. National statistics to Vipunen are compiled from publications that are in VIRTA service on March 15th. There is no general access to VIRTA service but all publications reported by the Universities starting 2011 and onwards are available in an excel. There is an ongoing project to develop a national research datawarehouse.